And more! We will also have 'Lightening Talks' where we showcase recent developments, and an opportunity to bring your own topics and share with fellow users and CiviCRM community members. Don't forget your sunscreen! The Global Community Summit is coming to Barcelona on October: Register Now! The site for the upcoming Global Community Summit in Barcelona is published. We are also collecting issues, comments, ideas, requests in the GitLab. If you consider yourself part of the community you should definitely register as soon as possible (we expect to have a full house). CiviCamp is coming to Leeds in May 2019! As part of this event, we are also holding two-day administrator training. These will take place at St George’s Crypt, Great George Street, LS1 3BR, which is only a short walk from Leeds rail station. CiviCamps are one day events covering everything related to CiviCRM. They are a great opportunity to learn about CiviCRM and what it can do for your organisation, meet other CiviCRM users, partners and Core Team members and gather their feedback, learn advanced strategies for managing your online database, ask any questions you might have, share tips and build connections! CiviCamps are casual, locally-organized one day events bringing together CiviCRM users, experts and those who want to discover what CiviCRM is and what it can do. This year, Software für Engagierte e.V., an association of CiviCRM users, came up with the plan to organize annual CiviCamps in Germany. 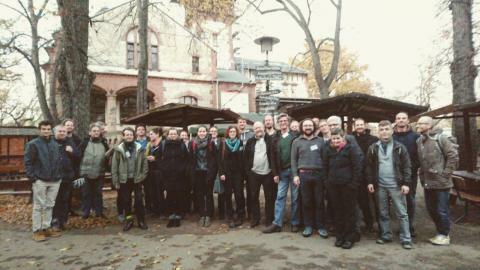 43 users, experts and interested organizations attended the first camp that took place November 15th in Halle (Saale). We are looking forward to the next CiviCamp in the UK! With only a few days to go we thought you might be interested to hear which sessions we’ve got lined up. If you’ve not booked on, there are still a few places so please get in soon. The day starts at 9:30 for registrations and then we start the first workshop at 10am, finishing the day at 5pm. We’ve got a varied list of sessions that should appeal to all, whether you’re just getting started or a seasoned veteran. CiviCRM-Anwender, -Implementierer und -Interessierte zusammenbringen: Das ist das Ziel der CiviCamps, die von der CiviCRM-Community auf der ganzen Welt veranstaltet werden. Nachdem es im letzten Jahr ein CiviCamp im Köln gab, hat diesmal Software für Engagierte e.V. die Initiative übernommen: Weil es in Halle und Leipzig besonders viele CiviCRM-Anwender gibt, organisieren wir das nächste CiviCamp hier. Besonders charmant dabei: Das Peißnitzhaus e.V., in dem das CiviCamp stattfindet, arbeitet selbst mit CiviCRM! CiviCamp Hartford is in less than a week! an on-site end-of-day reception with a complimentary drink ticket.